AVID is hands down the best ad management tool I use. On top of serving and managing my ads, I use their link tracker feature - which allows me to track my clicks and manage the redirect destination URLs to easily split test my landing pages – a feature that AVID developed at my request. They also offer 24/7 support, and listen to my feedback to constantly make improvements to the software to benefit us as clients. 10/10 would recommend. We were introduced to AVID by a marketer friend. We are very pleased with the service we are receiving from them. It allows us to populate our sites with banners by adding one simple piece of code. The pricing is fair as well, and we appreciate the service they provide. Customer service is on point as well - overall an A++ from us. Without a doubt AVID Ad Server has been our smartest investment in terms of online marketing and managing advertising space. The system offers several unique features and functions that set it apart from all other solutions on the market. You're not going to find another platform out there that lets you create and manage your ad placements, offers, and links- plus tracks the data through your entire funnel. The AVID support team is excellent and very helpful. All in all, we are very pleased with this partnership, and I highly recommend working with them. Use the same ad tag across multiple traffic sources. Scaling has never been easier. Our users trust AVID to run billions of ad impressions, native ads, and link trackers every month. The lights are always on at AVID. Using fault tolerant clustered hosting we deliver enterprise level performance with 99.9% availability. Create, serve, and monitor ALL of your ads in real-time with AVID's time-saving interface! Flexible month-to-month scaling options allow you to run as little or as many impressions as your company needs, from thousands to billions of impressions. With AVID's built in templates, create visually stunning native ad units that are optimized for the highest click through rates. Take advantage of each impression by showing multiple ads within the same banner. Make faster, better-informed decisions. Quickly pinpoint where you're wasting ad spend for each traffic source, ad, ad group, country, or any other metric - combined or independently. Increase brand awareness and boost your reputation with the help of whitelabeling. Customize every element of the AVID Ad Server user interface, from your ad serving domain to the logo throughout the platform to build your reputation as a reliable and growing brand. Get the most out of the visitors on your site by displaying beautiful non intrusive ads. You can create various types of overlays such as Exit Intent, Floor Ads, Sidebar, Interstitials, and Pop-Up. Serve, host, and customize VAST (2.0/3.0/4.0) compliant tags with the video ad analytics you need to optimize revenues. Easily create a custom, high converting HTML5 video ad using a combination of video and text elements - the options are endless! Streamlined work flow means seriously fast campaign setup. AVID's platform takes a performance first approach to campaign management, similar to the way you manage your campaigns in Adwords and Facebook. Watch our video to see how you can set up an ad campaign with AVID in under 2 minutes. AVID plays nice with other services. We easily integrate with Doubleclick, Google, Atlas, OpenX and many others. We also cater to developers, giving you the ability to customize our platform to suit your needs. AVID’s SDK supports the most popular ad formats with a proven record of effective performance in various types of applications. Apart from standard banners, you can fill each and every placement in your app with high‑impact interstitial and native ads that match the look and feel of your app. Serve landing pages, as well as ads, through AVID’s API. The landing pages can be sales pages, offer pages, or any other URL that you want to be able to test and rotate. Full control of how often your ads appear in rotation. Set your ads to run more or less frequently in seconds. Target your ads by country, province or state, or even as specific as city. Create as many user accounts as you need to manage and serve your inventory. Target your ads based on day of the week, by time of day, or both! Target and serve ads depending on which device, browser, carrier/ISP, or user-agent your users are visiting on. Group similar advertising from multiple advertising sources into a single, easy-to- serve ad placement. Limit the number of times an ad will show to a specific user. Target ad campaigns by custom variables passed through your ad tag like keywords, campaign IDs, network ID, etc. Our support team is available via phone, e-mail, or chat to help you make the most of AVID. Get free training sessions to help you get started, or make the most of all of AVID's most powerful features. Two AVID exclusive targeting features help you filter your traffic to identify IP addresses based on type (.com, .org, .edu, etc.) or use our proprietary database to identify known proxy addresses. Try AVID for 14 days risk-free. You can change plans at any time with no hassle. AVID is an industry-leading Third Party Ad Server platform used to store, manage, display, and rotate ads for online ad campaigns. There are many reasons why using AVID is better than just uploading your creatives to a Publisher, or even using a different ad server. Control – With AVID you can use our real-time data to make sure you are serving the right ad, to the right person, at the right time. Targeting – AVID not only has all standard targeting features like Geo-Targeting, Browser Targeting, Device Targeting, Carrier/ISP Targeting, and IP Targeting. AVID also has targeting features that you won’t find elsewhere, like Targeting up to 5 different custom variables, IP Type Targeting, and IP Type Targeting. 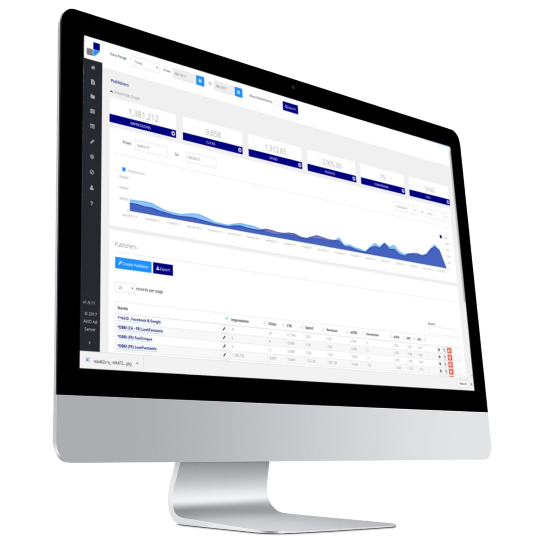 Reporting – Use our real-time data to quickly and easily breakdown and report by up to 3 different custom variables allowing you to optimize your campaigns for higher CTR and conversion rates. Easy To Use – While there is a learning curve with any new tool, AVID’s system mirrors how you set up campaigns in Facebook, Adwords, and other similar platforms. Our system is very user friendly and with our great online support, training videos, and help files you will be an AVID expert in no time. World Class Support – As we just mentioned, with any new tool there is a learning curve, and AVID’s support will always be there to answer your questions. AVID has a great support team dedicated to your success. You can contact us on our website, through email, through Skype chat, and over the phone. AVID is a great tool for any Publisher, Advertiser, Ad Network, or Blogger, and any one who owns a website or markets a product online. 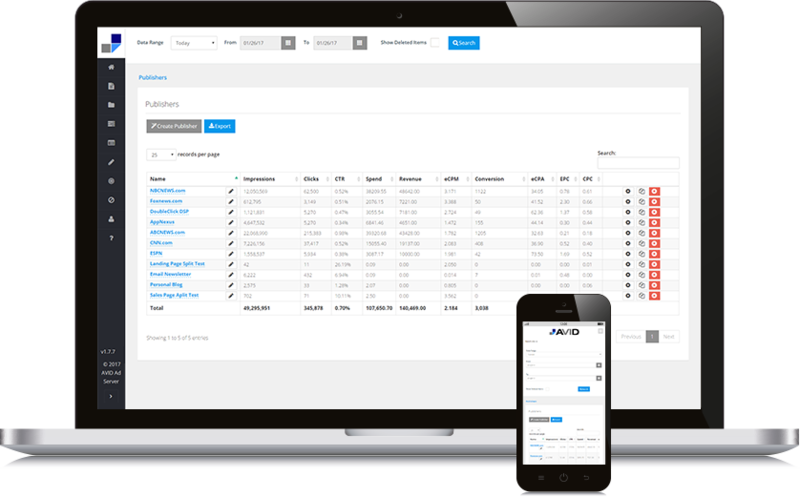 Contact us and we will show you how you can best use AVID to increase your revenue. Does AVID support text ads? Yes, with AVID you can easily create, rotate, and split test single banner ads or multiple ads in a single banner with ease. AVID has numerous templates available for all of our customers in all of the top ad banner sizes. Such as 120×600, 160×600, 200×200, 250×250, 300×350, 336×280, 468×60, 728×90, 300×600, 300×50 (Mobile), and 320×50 (Mobile). With AVID you can also become your own Native Ad Network. We have over 50 custom ad templates that will serve your needs. If you are looking for something specific, just let us know and we can create a custom template for you. Does AVID support video ads? Yes, with AVID you can serve, host, and customize VAST (2.0/3.0/4.0) compliant tags with the video ad analytics you need to optimize revenue. Does AVID support mobile ads? Yes, not only does AVID support mobile ads and have different templates you can test, but with our amazing reporting, you will be able to break down and optimize your mobile campaigns like never before. All of our standard pricing plans are month-to-month, which means you are never locked into a contract. At any time, you can upgrade or downgrade your plan on a monthly basis based on your impression needs. At AVID, we understand that the amount of traffic you run fluctuates, and we want to make sure our customers can easily adjust their plan based on their needs. Yes, AVID is certified and compatible with all major platforms. If you are wondering about something specific, just contact us and we’ll let you know. Is AVID easy to use? Yes, AVID firmly believes that our system is the most user-friendly and easy-to-use ad server on the market. Just in case you think differently, we have created numerous videos and help files, and we offer free training and support – available to all of our customers. Does AVID stay up-to-date with industry standards? Yes, AVID’s goal is to be an industry leader. It’s the reason why we are constantly improving our system. Many of our system updates have come from what our customers request as features, and we will continue to update our features to stay relevant.